The digital version of Canacoustica is now live at WFAE.net! 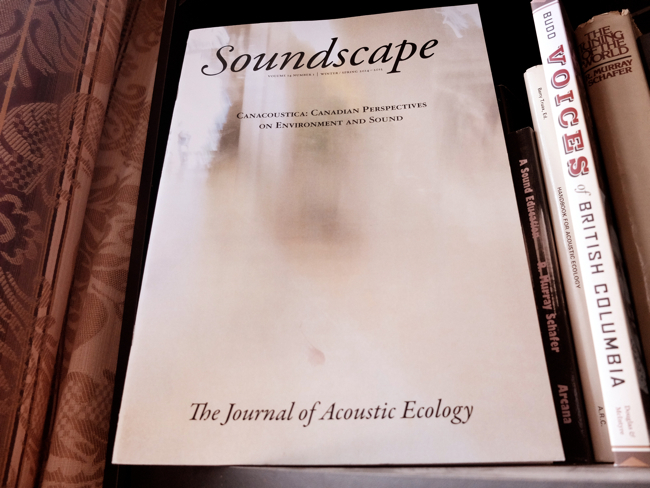 This latest issue of Soundscape: The Journal of Acoustic Ecology was a labour of love brought to you by we here at CASE, edited by Andrea Dancer with Eric Powell and Randolph Jordan featuring a broad range of Canadian perspectives on environment and sound by our board members. As it happens, this is the last issue to be offered in print format. 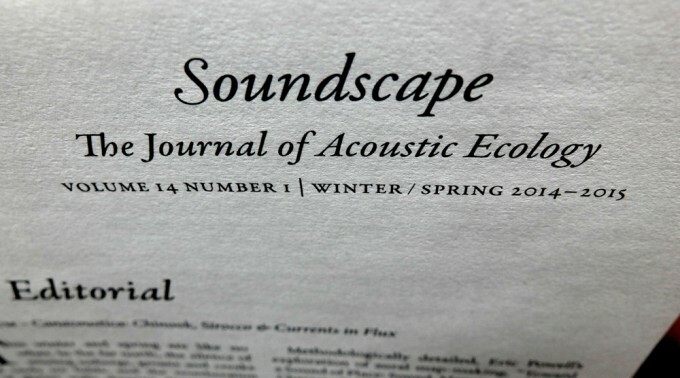 As such it marks a point of transition for the journal, and for the World Forum of Acoustic Ecology in general, as questions regarding the position of our work within the broader sound studies community loom large. Digital delivery of the journal itself isn’t a major issue; WFAE has long been archiving each new issue six months following print publication. Since print runs are small and go out to the membership only, I’m certain that the bulk of our readers are finding us online. However, there is always a sense of loss that comes with the abandonment of legacy formats and their attendant modes of production and consumption, inviting questions of how our practices of listening, and writing about what we hear, might shift in the years to come. It is appropriate, then, that questions surrounding changing practices within soundscape research are reflected in the content of this issue as our writers delve deep into Canada’s past, listening for resonances in the present moment while reflecting upon how to shape the organization of future investigations. These questions have been front and centre for CASE over the past couple of years as our organization works through a transitional period of its own. Things have been fairly quiet on home soil for quite a while, but some new membership and a reorganized board of executives has brought a flurry of activity behind the scenes over the past couple of years as we work to revitalize CASE for the digital environment. On that front we are happy to announce that a major project is nearing completion: Audio Postcards Canada, a curated online exhibition that will launch on July 18th, 2016 – World Listening Day. With funding from the Canada Council for the Arts, the completed exhibition will consist of 16 compelling juried “audio postcards” from across Canada that range from field recordings, soundscape and electroacoustic compositions, radio art, and various combinations of these areas. The exhibition will also include artist statments and bios, a feature introduction by Hildegard Westerkamp, a curatorial statement by Andrea Dancer, and audio interviews with jurors Tyler Kinnear, Stephanie Loveless, and Charlie Fox about their process. Stay tuned to our blog and Facebook page for more information about the launch. In the meantime, enjoy Canacoustica!